I’ve mentioned before that I’m a fan of the British luxe brand, but it’s definitely on my ‘treat myself’ list rather than my ‘repurchase regularly’ list. This stuff is pricey! The Elemis Rose and Lavender Recovery Regime is a collection of four of Elemis’ top-selling detox products, with some significant savings to be made. These little gems counteract the damaging effects of pollution and help repair the visible signs of ageing. Each capsule contains Moringa Oil which is clinically proven to have 1700% more anti-oxidant power that Evening Primrose Oil when applied to the skin. The pink Rose Absolute ‘day’ capsule restores a youthful bloom, whilst the green Lavender evening’ capsule helps to balance and repair stressed skin whilst you sleep. Gently exfoliates the skin, smoothing and revitalising the skins surface and is excellent for use before a treatment mask, it removes dead skin cells making the surface of the skin appear smoother and brighter. This is Elemis’ no. 1 best selling product globally! This super lightweight anti-ageing moisturiser is perfect day and night. Containing revolutionary Padina Pavonica, a marine algae that has ability to mimic the skin’s function to boost collagen in the skin and give you youthful skin and is proven to reduce wrinkles and increase hydration. 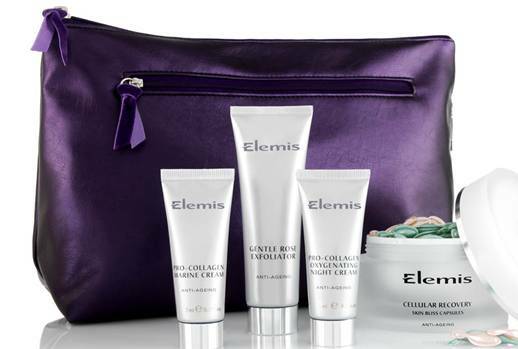 Available from 3rd May until 31st May 2010 at Elemis’ official online retailer www.timetospa.co.uk, spas, salons and selected retail stores. I’ve personally tried the (infamous) Pro-Collagen Marine Cream and became a huge fan…. but at retail price, I can’t really afford my habit… so continue to look elsewhere. I am very tempted by this offer though… If you do take advantage yourself, have a quick google for a discount code for Time to Spa, I know there are some around… but I think they all expire at the end of this month – boo! I love Elemis products, pricey yes, but they’re so good. Although they aren’t inexpensive, Elemis does often do online packs and deals. It’s worth watching out for the QVC TSVs (Today’s Special Value – yes, I’m a QVC watcher!) because you get a lot in those too. Ive also had the Elemis Marine Cream and loved it! can u use it if ur ages 20 something ? NYX Round Lipsticks Super Mini Haul & Mini Rant to go with!